Zarum, Dave. 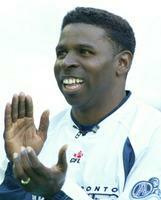 "Michael “Pinball” Clemons". The Canadian Encyclopedia, 02 August 2017, Historica Canada. https://www.thecanadianencyclopedia.ca/en/article/pinball-clemons. Accessed 25 April 2019. Michael Clemons was born in Dunedin, Florida, and raised by his single mother, Anna Marie Bryant. His father, Willie, lived over an hour’s drive away in Palmetto while completing a university degree in education. Just 18 years old when Michael was born, Anna Marie, a clerk at the nearby Shiloh Missionary Baptist Church (who later became the first African American to hold an administrative position with the City of Dunedin), was her son’s biggest influence. By the age of eight, Clemons had been introduced to football and began playing for the Dunedin Golden Eagles of the Police Athletic League, a youth organization funded by the local force. Despite his relatively small stature, Clemons was a natural athlete. He attended Dunedin High School and played multiple sports, including baseball, basketball and soccer, in which he led the county in scoring. But Clemons saw football as his best opportunity to secure a university education. An All-State player during his senior year in 1983 and Dunedin High School’s student athlete of the year, he received numerous offers from post-secondary institutions, including Harvard University, where Clemons was accepted on the strength of his grades. However, Harvard didn’t award athletic scholarships, so he instead accepted a football scholarship to the College of William & Mary in Williamsburg, Virginia. Despite initial concerns from coaching staff that Clemons was too small for college football (at five feet five inches or 1.65 m tall), he excelled on the field and was named an All-American in 1986. He found success off the field, too, and was named to the Eastern College Athletic Conference Honor Roll as a senior. Clemons graduated from the College of William & Mary with a degree in economics. In 1987, he was selected in the eighth round of the NFL Draft (218th overall) by the Kansas City Chiefs and played eight games. In 1989, Clemons signed a contract with the CFL’s Toronto Argonauts. The league’s wider field and open style of play proved a perfect fit. In his first game on 27 July, he returned seven kicks for 108 yards and earned player-of-the-game honours in a 21–17 win over the Edmonton Eskimos. Clemons had a breakout season in 1990, his second year with the Argonauts. In addition to returning kicks, Clemons ran the ball 105 times, caught 72 passes and scored 14 touchdowns. He finished the season with 3,300 all-purpose yards, which was a pro football record at the time. Clemons joined Bill Symons and Condredge Holloway as the third Argo to ever be named CFL Most Outstanding Player. In 1991, the same year an ownership group led by Bruce McNall, John Candy and Wayne Gretzky took control of the team, Clemons helped lead the Argonauts to their first Grey Cup title in eight years, beating the Calgary Stampeders 36–21. He won another Grey Cup with the team in 1996, due in large part to excellent chemistry with new quarterback Doug Flutie. The Argonauts won the “Snow Bowl” in Hamilton, Ontario, a 43–37 thriller over the Edmonton Eskimos. The following year, in the 1997 championship game, Clemons caught a touchdown pass from Flutie in the third quarter during a 47–23 rout over the Saskatchewan Roughriders, winning back-to-back Grey Cup titles. The same year, Clemons made 3,840 total yards, breaking his own record for total yards in a single season and earning his second CFL All-Star nod in the process. In 1999, he became the first pro football player to surpass 5,000 yards in four different categories (rushing, receiving, kickoff returns and punt returns). After a 12-year playing career (1989–2000), Clemons retired with a CFL record of 25,438 total combined yards. Partway into the 2000 season (his last as a player), Clemons became an assistant coach with the Argos. After only two games as player/assistant coach, he retired from playing and took over head coaching duties. After the 2001 season, he was promoted to president, but he returned to the sidelines on 17 September 2002 after a 4–8 start to the season. In 2004, Clemons became the first African American to coach in a Grey Cup. With Clemons at the helm, the Argos won their 15th championship, beating the BC Lions 27–19. He was a finalist for CFL Coach of the Year for four consecutive seasons between 2003 and 2006. After the 2007 season, Clemons retired from coaching with a 68–55–1 regular-season record. He was the second-winningest coach in franchise history and one of only three men to coach at least 100 games for the Argos. After retiring, he took a role in the front office as vice-chair, with the team winning another Grey Cup in 2012. Widely considered the face of the Toronto Argonauts, Clemons appeared on a stamp that featured the Argos as part of a series that celebrated the 100th Grey Cup. His three daughters, Rachel, Raven, and Rylie, were born in Canada. A Canadian football icon, Clemons is also known for his work in the community. He is an active public speaker and visits schools and children’s hospitals across the country. Clemons was named chair of the Youth Challenge Fund by Ontario premier Dalton McGuinty in February 2006 and is a board member of The Argos Foundation–Stop the Violence. He also works closely with Craig and Marc Kielburger’s Free the Children and WE charities, speaking at events and partnering with the organization to help those in WE Villages globally. In 2007, he and his wife, Diane, launched the Pinball Clemons Foundation, which has helped build more than 200 schools in eight countries.